This weekend the 18/19 Season ‘kicked’ off at Collingwood dock with both Div 1 & Div 2 playing. Checkout the results and standings on the the current standings page. Please see the form for all details, the sooner we have entries the sooner we can get everything in order for the season so please get them in earlier! As part of its ongoing development initiatives, the Academy will look to host an open age women’s only weekend at its Collingwood venue in late September. In hosting the weekend the primary objective is to initially gauge the interest in women wishing to aspire to and develope towards future participation in national leagues polo, to then assess the candidate’s potential to develope further thereafter. The invitational notice with more detail will be published at a later date, but the planned activities over the weekend will progressively address both the individual and team core game skills. In terms of competency as a minimum candidates will need to be comfortable in exiting a kayak capsize in open water. DON’T MISS THE NORTH WESTS PREMIER SUMMER TOURNAMENT! Please find our entry form for the 29th Liverpool Canoe Polo International on our web page. Entries and Tournament Fees must arrive no later than May 1st 2018. Any queries, don’t hesitate to call the club contact number or message our Facebook page. We hope to see you all here in Liverpool on May 26th and 27th 2018! 2017/2018 Season entries are now OPEN! The entries for the 2016/2017 season of the NW&C Canoe Polo League are open. All required information will be on the form but please refer to the relevant sections of the website for tournament dates. See here for more info on the summer leagues changes. Summer tournaments, Regional AGM, Referee courses, Coaching modules etc – if any of these interest you please keep reading. 27th Liverpool International Saturday and Sunday 4th and 5th June at Dukes Dock Liverpool. All abilities are catered for within a 5 pitch set up. Entry Fee including the use of the SFX College camp site, and club bar facilities as per recent years at £75.00 per team. Albert Dock Car Park Fees at £3.50 per car per day. Entries close on 7th May! We are prepared to host the following single day summer events dates at our purpose built 4 pitch club venue at the Collingwood Academy alongside some regional development opportunities. Sunday 10th July Will include a Grade 2/3/4 refs course on 9th July. Entry Fee £20 per team per tournament. £80.00 per 1 Team for 4 Tournaments if paid in advance by the 1st June. Free entry to the 12th June for regional teams if entering a team in the Liverpool International on the previous weekend. We already have 2 regional div 2 and 2 regional div 3 level teams entered for all 4 tournaments. The BC Canoe Polo Coach Bolt-on Module is booked for the 11th Sep. For this course you do not need to be a currently qualified coach, it can be done before attending a level 1 coach course. Again with other supporting clubs and their coach’s we are looking at the practicality of pooling resources, guidance and expertise to support a number of regional development days during the summer months, these would be open to anyone of any age or polo ability assuming some basic paddling skills. 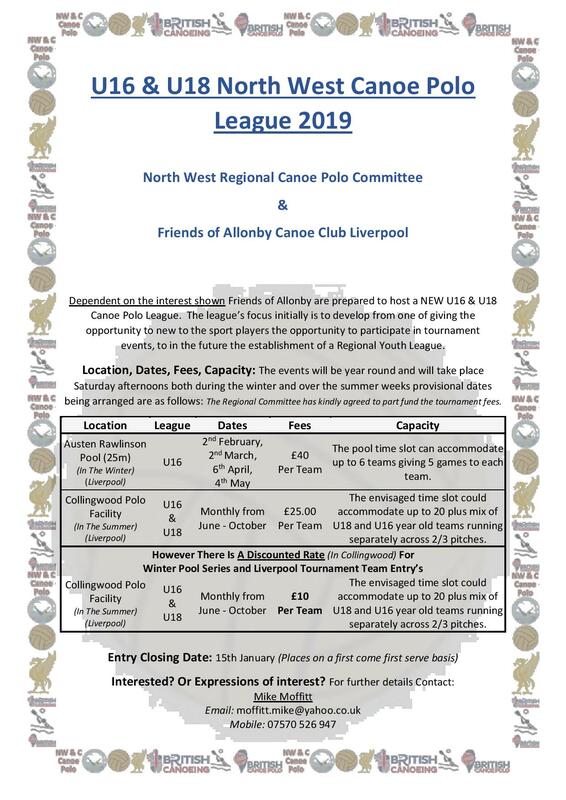 Dates for these will be released in due course, to help with gauging numbers and possible dates please email development@nwcpololeague.co.uk if you are interested in attending these opportunities. If you believe anything is incorrect or there is a problem please contact your division organiser first. Thank you all for your entries into the coming Season. The League is now full and teams have been allocated to divisions as detailed below, if you have any questions or comments on your allocation please email the League Coordinator ASAP. We are now reviewing tournament requirements and dates due to the larger number of entries than expected. We expect to add further tournaments and change the dates of some previously advertised. We will be in contact with team representatives shortly. *Fee’s unconfirmed as received, please send cheques or pay online ASAP if not done yet and inform the Treasurer that you have paid. **Cheque has bounced, the treasurer will be in contact to recover the entry fee.